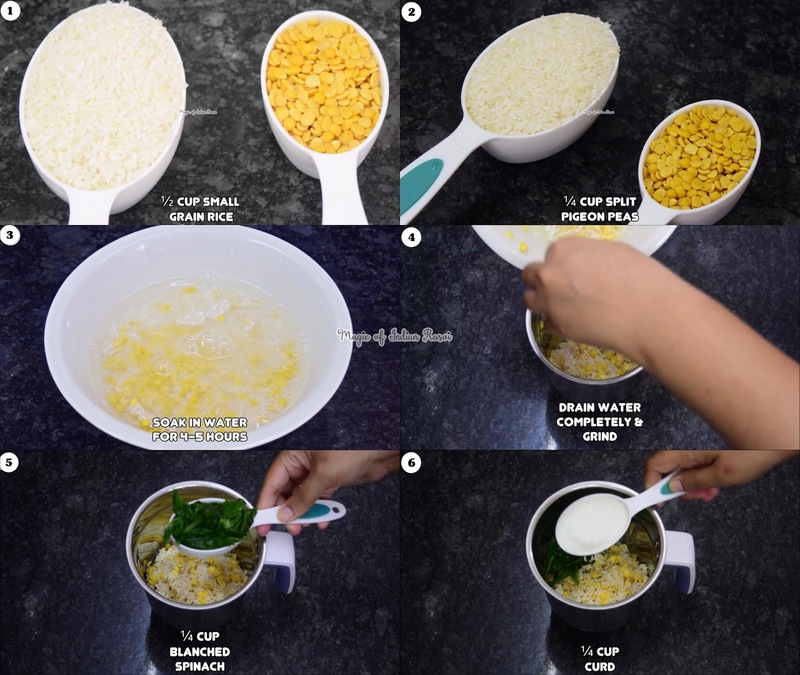 Toor Dal instant dhokla is a very easy to make dhokla at home. Dhokla are steamed savoury cake like snack famous in Gujarat. There are different types of dhoklas which can be made. 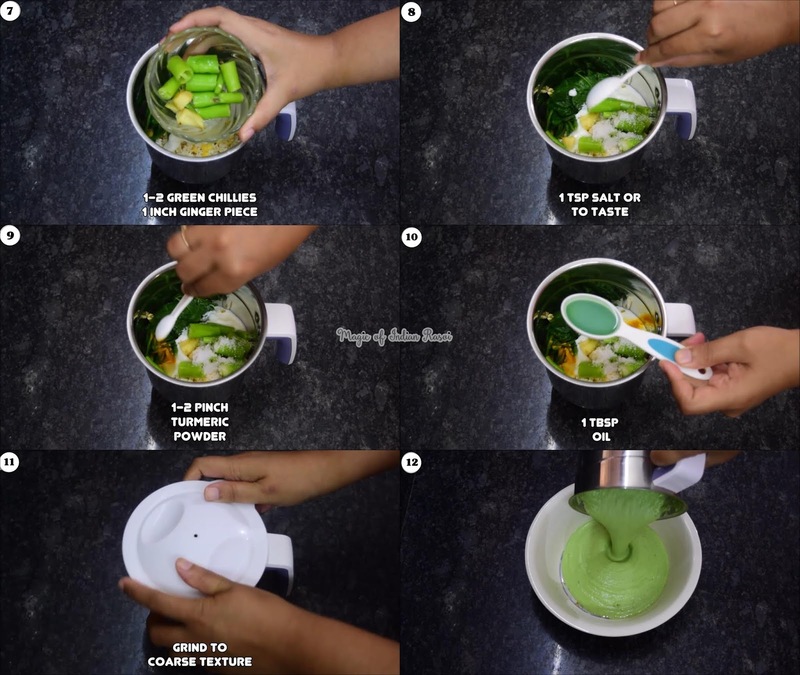 Here we are using split pigeon peas, rice & spinach to make this instant dhokla. This dhokla does not require fermentation of the batter & so it can be prepared without any extra pre-preparation (except soaking dal). It is very healthy & tastes delicious. Serve it with green chutney & sauce for breakfast or snack. Do try it today! Soak ½ cup small grain rice & ¼ cup split pigeon peas in water for 4-5 hours. 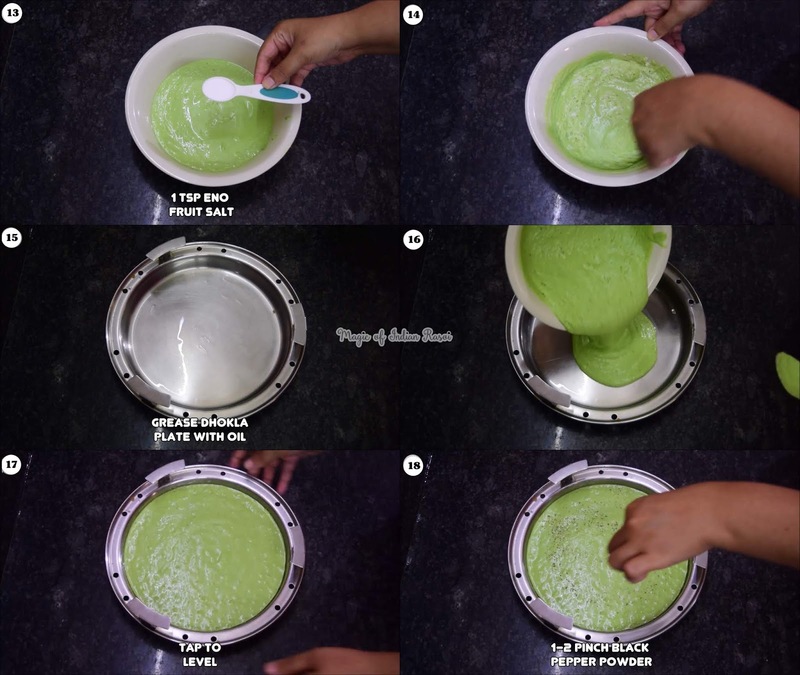 Drain water completely & grind with ¼ cup blanched spinach, ¼ cup curd, 1-2 green chillies, 1 inch ginger piece, 1 tsp salt or to taste, 1-2 pinch turmeric powder & 1 tbsp oil. Grind to coarse texture. Add 1 tsp eno fruit salt & mix in one direction. 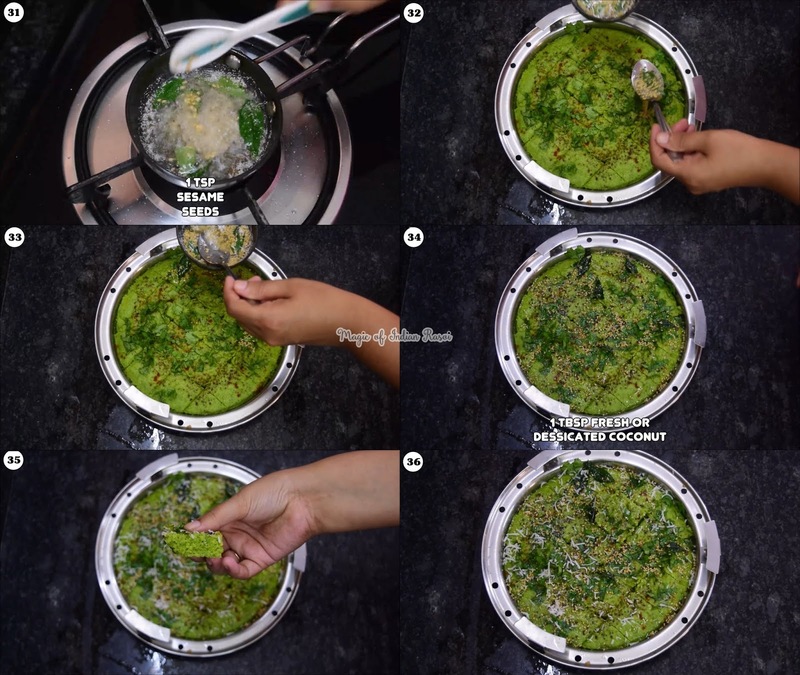 Grease dhokla plate with oil & pour the mixture in plate. Tap plate to level it. Sprinkle 1-2 pinch black pepper powder & 1-2 pinch red chilli powder over the mixture. 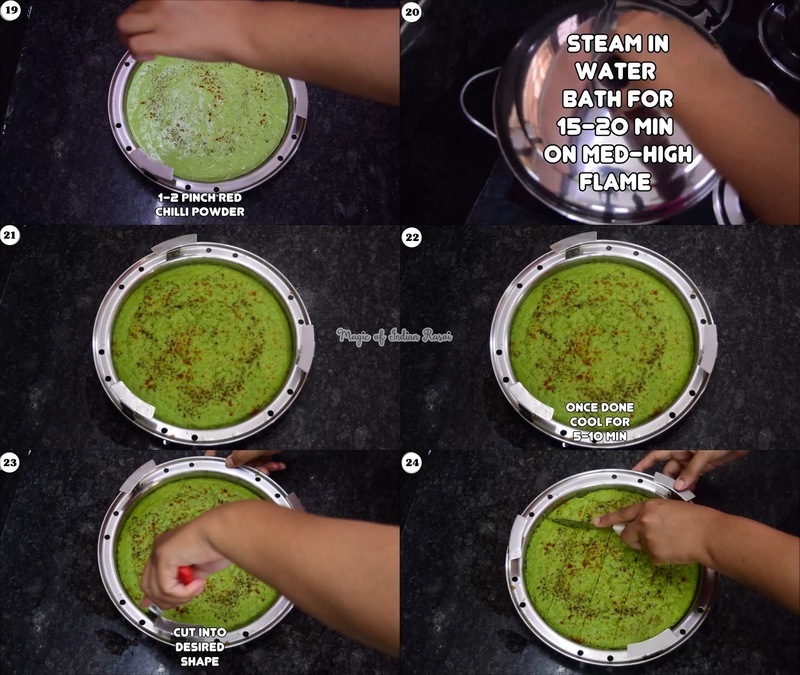 Steam in idli-dhokla steamer for 15-20 min on med-high flame. Once done take out plate from steamer & allow it to cool for 5-10 min. 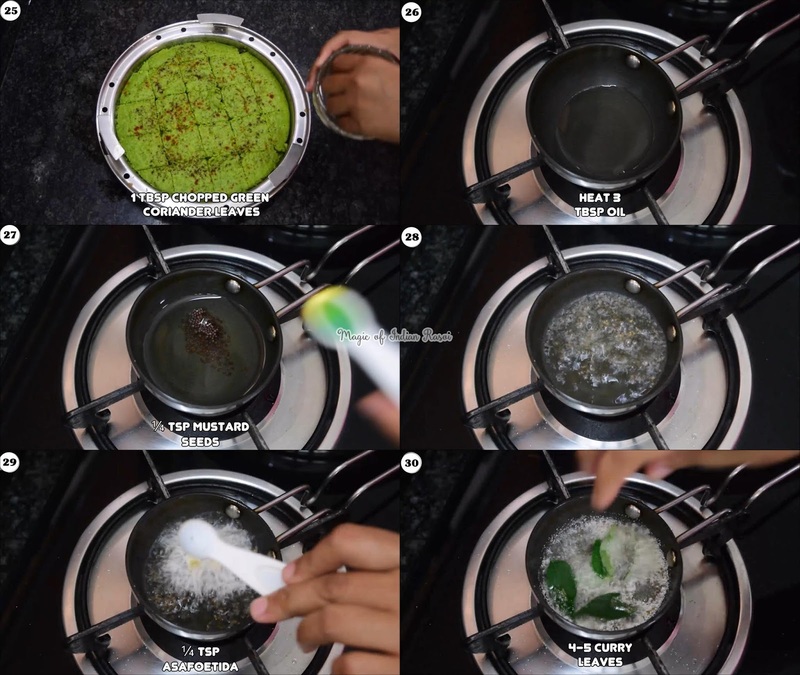 Sprinkle 1 tbsp chopped green coriander leaves over dhokla. Add ¼ tsp mustard seeds & allow it to crackle. Switch off flame & add ¼ tsp asafoetida, 4-5 curry leaves, 1 tsp sesame seeds. Garnish with 1 tbsp fresh or dessicated coconut. When it comes to snacks, dhokla is the legit option and this variation is very amazing. Thanks for sharing, will try it out.